Summary from Goodreads:Vika Andreyeva can summon the snow and turn ash into gold. Nikolai Karimov can see through walls and conjure bridges out of thin air. They are enchanters—the only two in Russia—and with the Ottoman Empire and the Kazakhs threatening, the Tsar needs a powerful enchanter by his side. Despite the 3.5 star rating, I actually really loved this book. So why did I only give it 3.5 stars? There were just a few issues I had with the book that I’ll get into in a minute, but first, why not start off with what I loved? Rarely is there more than one enchanter in Russia at a time, and when there’s two, they must compete in the Crown’s Game. I will admit that when I read the synopsis I immediately though of Throne of Glass, but it was nothing like it. So, Vika, one of our main characters, has grown up thinking she’s the only enchanter while Nikolai, the other one, has always known there was but didn’t know who. 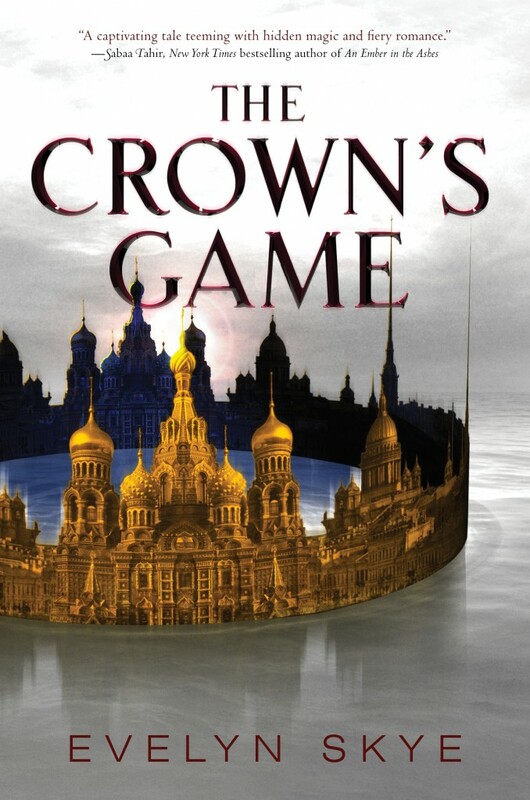 When the tsar realizes he needs an enchanter to help advise him, the Crown’s Game begins and Nikolai and Vika must fight to win the competition because the loser will die. Yet, the two end up falling in love. Not only does Nikolai realize he loves Vika, but so does Pasha, the crown prince and Nikolai’s best friend. The Crown’s Game is a historical fantasy book set in Imperial Russia. The setting was one of my favorite parts. Everything was so vividly described that I had a perfect image in my mind the whole time. Evelyn Skye did such a good job with describing Saint Petersburg, it was as if you were really there! This is probably one of the best researched historical-fiction books I’ve read in awhile. You can just tell how much research went into it, and the fact that Skye studied Russia in college definitely shows. Honestly, the world-building (is that the right word when it’s historical fiction? I don’t know) has to be my one of my favorite parts of the story. Vika was my favorite of the three main characters. I loved her as a character. She focuses more on magic involving the elements, like for example, instead of tailoring a dress, she actually made one of snow. How cool is that? Her whole life she’s been training under Sergei, a man she has grown up believing is her father. Both of them thought that when Vika turned eighteen, she would become the Imperial Enchanter. So, she has been training hard for when the day comes that she turns eighteen. I liked Nikolai, but I liked Vika and Pasha more. His mother died when he was born and he never knew his father. When he was young (seven or eight I believe), the Countess Galina (who I hate) took him in to train him to be the Imperial Enchanter and for the Crown’s Game. Not long after he arrived in Saint Petersburg, he also met and befriended Pasha, the prince. I don’t know why I didn’t like him as much as the other two, I just didn’t. He came across as very jealous and annoying at times. Pasha, the crown prince, which is short for Pavel, is another one of the main characters. He hates the pompous life that comes with being the prince, and wishes that he could just lead a normal life. So, he often sneaks out of the palace to go hang out with Nikolai. He also has no clue that Nikolai is an enchanter, or what the Crown’s Game is and that it has started. I actually really liked Pasha’s character, though the whole prince-who-wishes-he-was-normal-and-sneaks-out-of-the-palace thing is kind of overused at this point and cliche, but whatever. The ending tore me to pieces though with him. This story is told from a ton of POVs, which is one of the reasons I had a hard time with it. My favorite character overall has to be with Ludmila, who we also get a few chapters from. She owns a bakery on the island Vika has grown up on, Ovchinin, and has become very close with Vika in the process. So when the game starts and Sergei is taken away to SIberia, Ludmila joins Vika in Saint Petersburg. We also get chapters from Princess Yuliana, Galina, Renata (a maid at Galina’s home and friend of Nikolai’s), Sergei, the tsar, and a few others. I’ve mentioned before how much too many random POVs annoys me, and though they were all still centered around our three main characters, there were a bit too many for my liking in this book. I wasn’t a huge fan of the romance either. It felt like Pasha and Nikolai were both trying so hard to be with Vika and that she wasn’t really in love with either of them. There was definitely insta-love and I wasn’t a fan of the love-triangle, but it just seemed like Vika was never in love with either of them. I wouldn’t actually mind if the series ended with her not actually being with either of them because the romance felt so underdeveloped. Or hopefully the romance will be developed more in the next one. The magic was enchanting. I loved all the descriptions of how it works, like how Vika was able to feel the thread and just throw Nikolai’s enchantments off of her. I thought that was so cool. I do wish there was more magic considering this book is centered around it though. Seriously, I just found it soooo cool and fascinating how the magic in this world works. The writing wasn’t my favorite, but I really enjoyed it. The world-building was amazing, but just the writing in general wasn’t spectacular, it was still good though. But because it was told from so many POVs it was harder to kind of immerse yourself into the story when it was always changing. I absolutely loved all the food and dessert descriptions though. It made me want to stuff my face with cake during the scenes set in Ludmila’s bakery. Like I mentioned, the synopsis kind of made me think of a few other books with competitions to become the king’s enchanter or something or other, like Throne of Glass for example. The plot wasn’t anything all that original or special, but the world-building and magic totally made up for it for it. I definitely recommend this book, there were just a few things I had a hard time. I didn’t find it to be all that confusing, though I would have liked more detail in the beginning of how the competition worked. It was a great book though and I thoroughly enjoyed reading it. AAAH! I actually listened to the audiobook of this one for the Crown’s Game Readalong. I actually didn’t think it was Throne Of Glass like, which I will admit I picked up just for the hype. I completely agree with you on the fact that the romance was underdeveloped. It was so SO Insta-Love, I didn’t know what to do with it, and also while the magic was awesome, I just couldn’t see how enchanting fountains and creating islands meant the enchanters had the knowledge to help make political decisions about a country. Sigh. I will be reading book two, and I really do hope it gets better! I really really hope Skye develops the romance more in the next book, otherwise I will be so sad. I think the romance has potential, it just wasn’t done very well. In fact, it didn’t even seem like Vika liked either of them that much. I agree with you on the magic as well, sure their enchantments weren’t impressive, but none of them seemed like anything that would actually help them to win the game to be the King’s advisor. Thank you! I’m really interested with this book. I’ve never read any books set in Russia and I love historical settings! Although I get confused when there are multiple unnecessary POVs and I’m not a fan of forced romance. Great review!! This is the first historical fiction book I’ve read set in Russia and it was amazing. The descriptions of the city were so vivid it was like you were actually there. I agree as well, those can both be very annoying, but they weren’t terrible in this book, otherwise it would have been more like 3 or 2.5 if they were that bad. It’s still a great book though, so I hope you have the chance to get to it! Thank you! If I rated it based on how much I enjoyed it, it would be a 4.5 for sure, but there were still a few little technical details. I loved this book! The magic was my favorite part. I know what you mean about all the different points of view, though. I saw the point of most of them, but the occasional chapters that had the POVs of the minor characters seemed really unnecessary. I just wanted to get through them quickly to find out what happened with Vika and Nikolai. Yes, the magic was wonderful, very enchanting! 😉 All the POVs did make sense, definitely, and were always centered around the three main characters, though I do wish they were mainly from the three. I totally agree.